Eliminate your exposure to trucking's single most common and serious braking issue. Trade information and distribution opportunities for Brake Safe Logger™ and Termin-8R® in the UAE and Middle East regions. Brake Safe Logger™ is a visual indicator of brake stroke travel that enables you to quickly determine whether your brakes are in or out of adjustment... anytime, anywhere. Complete a pre-trip inspection without the continuous need to apply the brake pedal with a second person or a pedal depressor. Check brake adjustment roadside without the need to apply the service brakes. The Brake Safe Logger consists of two system components, the brake readjustment monitor and the stroke logger. The brake readjustment monitor consists of a steel bracket and pre-measured, U-shaped reference unit (Goalpost) that matches the recommended brake reserve readjustment point, and a clevis pin activator with a tooled pointer. The stroke logger has an engineered, black plastic housing, red nylon arrow indicator and cotter pin stopper. The goalpost and housing with the arrow indicator are attached to a bracket that mounts permanently onto any power unit, truck, trailer or bus air brake chamber using the existing mounting stud and nut. A replacement clevis pin with a tooled point is inserted into the slack adjuster replacing the existing clevis pin. Yellow and red plastic covers provide enhanced visibility. The arrow indicator indicates the furthest point of brake stroke travel and whether the brakes are in or out of adjustment. Apply the service brake at 90-100 psi, release brake, then activate the parking brake and check the position of the arrow indicator. Check the position of the arrow indicator without applying the service brake. Eliminates need to crawl under truck or trailer. Driver does not need technical information about brake chamber type and re-adjustment point. Roadside brake inspection without service brake application. Reduces downtime due to unnecessary brake adjustments. Eliminates mechanics needlessly adjusting air brakes. Identifies slack adjusters that have not been correctly set up. Assists in identifying other problems such as weak or broken springs; and worn, seized or incorrectly installed brake slack adjusters. Installs in minutes with regular shop tools. Avoids heavy fines imposed for out-of-adjustment brakes. Eliminates roadside detainment and downtime for the driver and the equipment. Reduces mechanics' shop time troubleshooting and repairing air brake problems and other faults in the foundation brake system. Assists balanced braking, reducing uneven brake and tire wear. Extends the operational life of slack adjusters by reducing the wear and tear associated with repeated adjustments. "Substantial savings in both time and money." Promotes a culture of safety on the road. Promotes balanced braking in normal and emergency situations. Ensures maximum braking capacity in emergency situations. Demonstrates to regulatory and inspection agencies a proactive commitment to safety. Even if a vehicle is equipped with automatic slack adjusters, there is still a need for the driver or mechanic to inspect brake stroke travel on a daily basis. Automatic slack adjusters are good but require proper maintenance for reliable performance. Brake Safe Logger will pinpoint whether your brakes are in or out of adjustment and can indicate whether your slack adjuster is working properly. The majority of brake adjustment fines and out-of-service orders are issued to vehicles equipped with automatic slack adjusters. For example, during September 2013, Operation Air Brake resulted in 20,067 roadside inspections in North America and 5468 out-of-service violations. 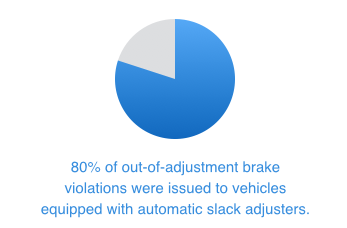 59% were brake related, and of those, 56% were out-of-adjustment brakes. Of these out-of-adjustment brakes, 80% were equipped with automatic slack adjusters. What happens if the housing gets filled with sand, mud, cement or other debris? Brake Safe Logger has several features that prevent it from seizing in severe conditions. The housing has 22 tab locking holes that immediately eject debris as the indicator moves through it. The indicator has an angled wedge design that expels mud, sand and dirt, cement, lime stone dust build-up, and larger debris. Will it stand up to extreme conditions? Brake Safe Logger is manufactured to last. The bracket, goalpost and clevis pin are made of steel and zinc plated for corrosion protection. The logger components are constructed of an engineered plastic composition for durability in extreme operation. The indicator is made from high-impact nylon, and the housing is fabricated from durable, self-lubricating acetal ensuring reliable part movement with no binding resistance. Brake Safe Logger can be installed in minutes with normal shop tools. Simply bolt the housing and goalpost onto the bracket, slide the indicator inside the housing, and insert the clevis pin into the brake adjuster. Each kit includes detailed installation instructions and easy-to-follow diagrams. Can I use it with all my equipment and how do I figure out parts? Brake Safe Logger can be used with all air activated brakes, excluding air disc brakes. Three kits cover all applications. One kit outfits all heavy duty tractors and trucks while two kits cover all trailer applications. Three universal kits fit all trucks, trailers and buses. Equips all HD Commercial vehicles including tractors and all trucks including refuse, construction and dump, ready-mix, tank and fire trucks, HD tow trucks, school buses, motor coaches, etc. Equips most trailers including box & dry vans, beverage, bulk, chassis, aggregate, livestock, logging, etc. Equips trailers with SUPER SINGLE wheels, flatbed, auto hauler and lowboy trailers. Contact Multirep Trading FZE for trade information and distribution opportunities regarding Brake Safe Logger in the UAE and Middle East regions.